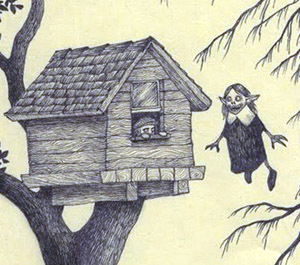 The drawings are all wordless and don’t even have titles, and they are all creepy as hell. The artistic style puts me in mind a bit of both Gahan Wilson and Charles Addams, and it’s remarkable how much is suggested by just a single scene. A few of them rather charmingly depict people and monsters interacting playfully, but there’s a definite feeling of, “Oh, this isn’t going to end well,” about most of them. There are lots of giants and teeth and floating and children being menaced and after you look through the archives you’ll find yourself glancing nervously over your shoulder every so often. Fantastic stuff. *The URL is “johnkenn” and his profile says his name is John Kenn, but the site is called “Don Kenn Gallery,” so you figure it out.